THATTA – The Jamia Masjid of Banbhor, which is said to be the first mosque of South Asia was built in 8th century AD after the conquest of Sindh by Arab warrior Muhammad Bin Qasim. It is located among the ruins of centuries-old city of Bhanbhor, in Thatta district. 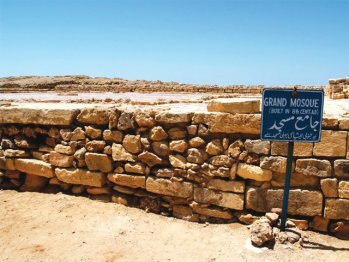 The ancient city is associated with Muhammad Bin Qasim and the legendary love-story of Sassui-Punhoon, which great poet Shah Abdul Latif Bhittai sung in his poetry.